Maybe you already started crate training your puppy and have already hit those frustrating first few days or maybe you are just prepping for that new puppy. Either way when you first start crate training the future benefits of a well-behaved, crate trained puppy are not always apparent. Every puppy is different. This isn’t a post about how to crate train your puppy. You can find that here, but instead I’m going to talk about some of the future benefits of crate training a puppy. 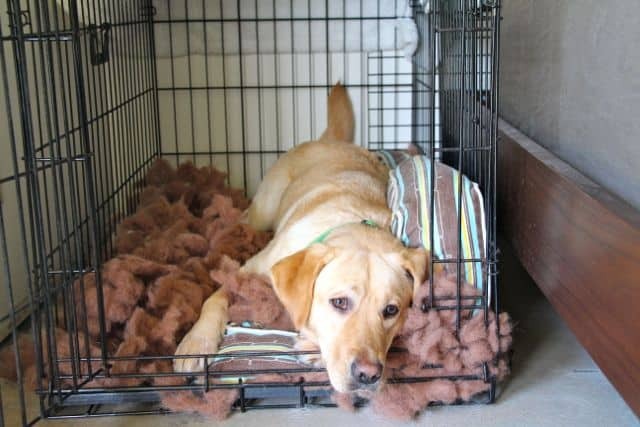 Crate Training Tip: You may want to remove bedding from the crate. Some dogs like to pull out the stuffing…Adelle. If you live in Orange County, California then you may have noticed that we’ve had some hot, windy days over the past month. Linus has noticed. Linus is my rescue and unfortunately he’s a little more sensitive to outside noises and can get anxious from time to time. These recent gusts of wind have produced some unusual noises outside the house which has had Linus spooked on occasion. This is not uncommon for us. Fireworks, thunder, heavy rain, wind, basically any kind of loud sound outside the house puts Linus on high alert. Linus has a Thundershirt and it definitely helps although I wouldn’t say it’s the end all be all of curing his anxiety. However, what helps Linus the most during these stressful times is his crate. The last few days when I’ve noticed Linus is no where to be found I would look around the house and low and behold he’d be lying there in his crate. Anytime Linus is stressed he goes back to his crate for comfort. Linus views his crate as his den, his safe place, his place to kick back and relax. When you crate train your puppy he will view his crate as his den. When I first crate trained Linus I never thought it would help him with anxiety, but it does and thank goodness for that. Back when I was in college one of my buddies who worked construction was always reminding me: “Colby, don’t forget. Safety First!” Since then I’m always hearing in the back of my head “Safety First”. When traveling with your puppy it’s definitely a good time to think about both yours and his safety. While driving around in the car with your puppy there are several safer options then letting your puppy hop around the front or backseat sticking his head out the window. One option is crating your puppy while riding in the car. If you’ve crate trained your puppy then they will easily relax in the crate while you drive along your merry old way. If not, it could be stressful for both you and your pup. If your puppy is loose in the car and you get in an accident this could be deadly for both you and your pup. If your puppy is loose in the car and sticking his head out the window he could fall out (believe me I’ve seen it happen). If your puppy is loose in the car he could get injured with a sudden stop. If your puppy is loose in the car he could distract you and cause you to get in an accident. As I said crating your puppy is not the only safe way to drive with your puppy, but it is a better option then allowing your puppy to be loose in the car while driving. We adopted Stetson after he was dropped from the Guide Dog program and we wanted to continue training him in some aspect so we decided to enroll him in K9 Nosework training. Nosework training was a great activity for Stetson and helped to work both his mind and body. You could crate your dog while other dogs trained. You could put your dog in the car to wait for you. While both options were okay, crating your dog was preferable especially on warm days when you would not want to leave your dog in the car. Lucky for us we crate trained Stetson and he had no problem sitting quietly in his crate waiting for his turn. However, some of the other dogs didn’t do as well in the crates and had to wait outside in the car. We don’t participate in all of the different canine sports and activities, but I know there are others that probably require your dog to be crated while other dogs compete. At the America’s Family Pet Expo I noticed dogs being crated while others performed agility, dock diving, and rally. While we haven’t gone on a ton of trips with our puppies in training we have been on a few. In general our puppies in training will get access to places other dogs are not allowed among other things, hotel rooms. One of the benefits of crate training your puppy is when visiting a hotel room you can leave your puppy in his crate and if he was properly crate trained he will be calm and quiet if you need to leave the room. No need to worry about him tearing up furniture, chewing on the carpet, or having an accident in the room while you’re away. While your dog may be perfectly trained a new, stressful situation like a hotel room may cause him to act out in some way. You never really know how a dog will react when in a new environment with different sights, smells, and sounds. A practically perfect puppy could get anxious and resort to chewing, digging, barking, howling, or whining. If you have a safe familiar place like your pup’s crate then he will definitely feel more at ease. The first few days of crate training are probably some of the most difficult times for most puppy raisers. Sometimes you get lucky and only hear a few whimpers while other times you end up with a “Stetson” and you have to do without sleep for about a month. Most likely you’re puppy will be somewhere in between. One thing to remember…well actually 4 things are the future benefits of crate training we mentioned above. Keep these 4 future benefits in mind when times are tough during those early crate training days. Good luck with your training! If you were looking for our short guide on how to crate train your puppy check it out here. What about you? Have you realized any future benefits after crate training your puppy? Tell us about it in the comment section below. Our first puppy came crate trained at four months old and we had few problems with her. So when we got our second pup a few months ago at 8 weeks ( a found stray) crate training was a no-brainer. CoCo was great and only whined for about 15 minutes, and much less the second night. I was surprised and pleased. But sometimes she acts like she had some of this being-a-dog stuff down pat and other times she acts like a regular you-talkin-to-me? kind of puppy. Now I can say “Go to bed” and she knows where to head which is especially nice when we’re in a hurry to leave and at the end of middle-of-the-night-potty outings. It sounds like you’ve got two great puppies. I’m not sure if you had a chance to see our other blog post on crate training puppies, but in that post we talk about the many different things you can do to help your puppy get used to the crate. Believe me we tried nearly everything with our first guide dog puppy, Stetson. It took us nearly a month with him. Clearly he was an anomaly because he was the only one that really took longer than a week to get used to the crate. I’m glad to hear that CoCo is doing well with training. I’m sure she’ll exit that “you talkin to me” stage real soon. Thanks for sharing your story! Colby, I really liked this post. Yzerman put up a fight when I got him and I used one of those ‘air travel’ crates, he couldn’t see out of it and wouldn’t stop whining. I bought a wire crate the next morning and that made all of the difference. It’s gotten to the point that he will not eat unless his bowl is in his crate. When I travel and have him stay with friends I bring his kennel with him and it’s his personal spot and if he needs a break from their children he retreats to it. Additionally I will leave him with his trainer if I have a long day at work and will be away for a while and he will find his crate when he is done interacting and wants to be left alone. One question I have is about marking. Yzerman knows the ‘get busy’ command and will almost always relieve himself if I give the command. The other day at the dog park we frequent everyday he ‘marked’ a female dog owner. I was petrified after talking to other pet parents I’ve found that this is a common behavior. I have never seen him do it and it was not a mistake, he did it intentionally. Any thoughts? It’s good to hear from you. I’m glad Yzerman is doing well. Yes, the dogs and I really love the crate! Regarding marking: Are guide dog puppies are not allowed to mark and it’s something we start working on when we first bring home our pups. When we’re out and about working with our puppies in training they are not allowed to sniff around like most other dogs. The sniffing around is what usually leads to marking. We use the command “no sniff”, correction if they don’t stop sniffing, then praise when they stop sniffing. Of course if a puppy tries to mark then the command is “no”, correction, and praise when they stop marking. Another thing we work on with our pup’s is we make sure and have them “get busy” before any walk. Once we start our walks our pups are not allowed to potty until we finish our walk. When we return from our walk our pups are again allowed to “get busy”. Our guide dog puppies have to follow some pretty strict rules since they will be working in the public. These rules may not be appropriate for pet dogs like Yzerman, but of course that is up to you. Good luck with your training! Let me know how it goes. Beautiful Blog! Crate training your puppy is very important and is also beneficial as you have explained in your post. Dogs remain quite and calm while traveling.